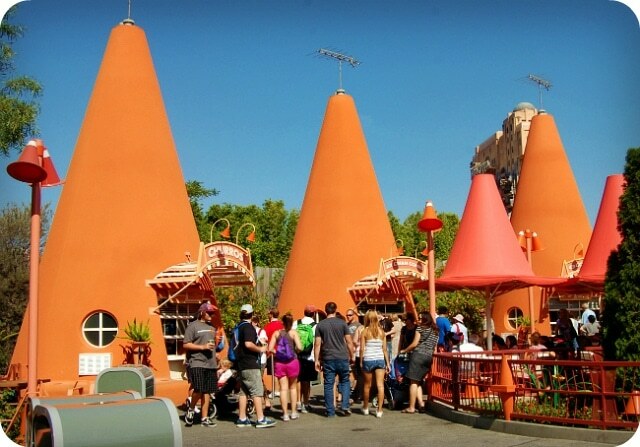 There’s no shortage of yummy food and drinks in Cars Land at Disney’s California Adventure. From light snacks at Fillmore’s Taste-In to hearty diner fare at Flo’s V8 Cafe. But the one concoction that was on the must-try list on my recent visit to Radiator Springs was Red’s Apple Freeze at the Cozy Cone Motel. 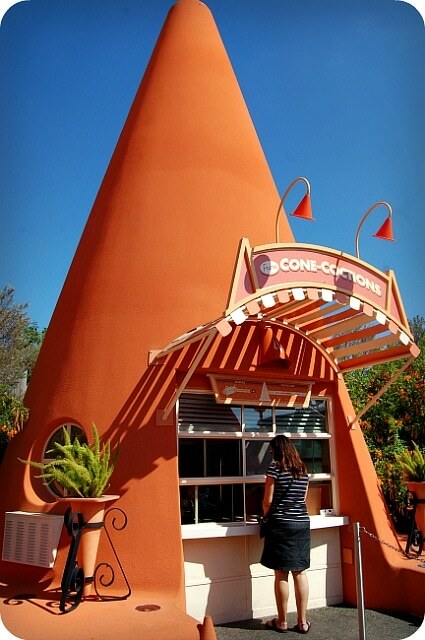 The Cozy Cone is set up where every cone offers a different snack and beverage. 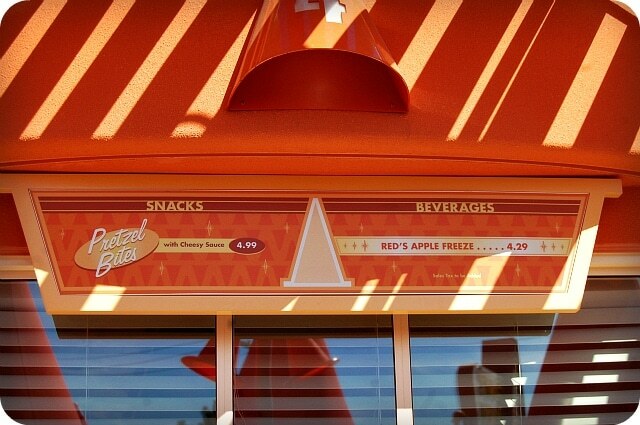 Cone #4: Cone-Coctions, sells the now famous Red’s Apple Freeze along with Pretzel Bites and Cheese Sauce. For $4.29 you get a large 16-ounce cup of 100% frozen apple juice swirled with marshmallow syrup and topped with an all natural, non-dairy passion fruit-mango foam. At first glance, it’s very reminiscent of Butterbeer at The Wizarding World of Harry Potter. But after one sip, it’s obvious that Red’s Apple Freeze has a taste all its own. The drink is very sweet with the base flavor being apple. The combination of marshmallow gives the drink notes of caramel without tasting like caramel apple. That combined with the tropical passion fruit-mango foam makes for a unique and delicious concoction that you just have to try. Red’s Apple Freeze is definitely a beverage that I would go back and order again and again! 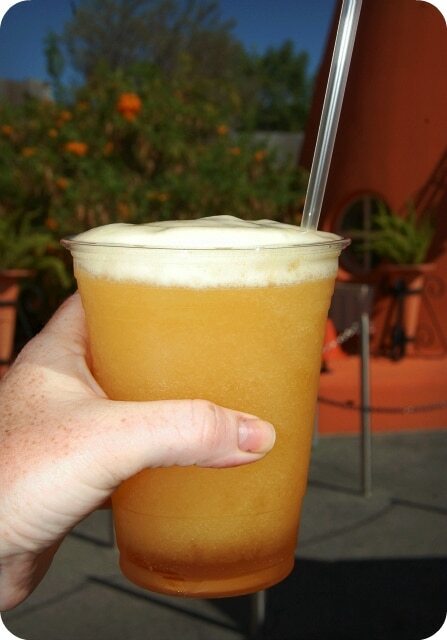 The good news is that I don’t need to fly back to California for another sip of Red’s Apple Freeze — though I would in a heartbeat 😉 Gaston’s Tavern in the new Fantasyland at the Magic Kingdom in Walt Disney World will serve the freeze under the name “LeFou’s Brew”. The non-alcoholic beverage will be sold in adorable souvenir steins and goblets for adults and kids alike.